The EXPO aimed to raise awareness, and to communicate and demonstrate for rural communities strategies for improving their standard of living and satisfying their basic needs without compromising the quality of life for future generations. The exhibition focused on replicable models for sustainable food production, appropriate technologies, and on promoting ways to enhance, restore and utilize indigenous knowledge systems. Afristar helped to design, create and install the interactive displays that formed the heart of the EXPO, including a demonstration medicinal garden, a model home nursery, a permaculture homestead food garden, and various types of appropriate technology. Also demonstrated were ways to incorporate hands-on environmental education into school curriculum. 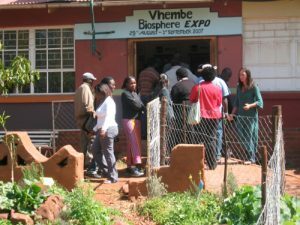 All in all, the EXPO succeeded in highlighting economic and entrepreneurial opportunities associated with sustainable development in the area, and served to promote and complement the Vhembe Biosphere initiative’s goal of fostering economic and human development for the attainment of sustainable livelihoods that are socio-culturally and ecologically sensitive.